I had all these thoughts rambling around in my head and wanted to get them out. Now I can’t form a sentence. I guess I have questions. Why do you go back to the pit when you’ve seen the LIGHT? I get that it’s comfortable, a place you’re familiar with. You’ve spent so much time there. But why is it so easy to go back to that place and dwell there? Why do you not fight? It’s so easy for you to give up. And don’t tell me you’ve been through crap and back, because I KNOW THAT! I just want you to speak up to those that are doing wrong and stand up for yourself. And maybe even realize everyone goes through their own kind of crap, some of which is far worse than what you do. Why do you call me to vent about someone yelling at you, that you’re not going to be yelled at again today, and end up yelling at me. How is that right? Why do you not see that? Do you wonder if, or when I will be done? How can you not see the effects of your attitude? It’s like a riptide that carries everyone out to sea and underwater. It’s not just you. Why do you shut me out and push me away? You close yourself off to anyone who wants to help. You withdraw when you need to reach out. Why do you think so little of yourself? You are a child of God, created in His own image. He loves you and He has great plans for you. Believe His promises. Rebuke satan. Top Ten Reasons Why I Feel Old. Very Old. I have a birthday coming up. Next week. It’s not the BIG birthday, but it’s the one before the BIG one. ‘Nuff said. I’m feeling old as of late, and here are some reasons why. 1. I have a decision to make. Embrace the grey hair or spend the money to cover it up. Honestly, I’ve tried to embrace it, and pluck it out with tweezers, and neither is really working for me. 2. This year Brian and I will celebrate our 18th wedding anniversary. Wow!! 3. My oldest baby has officially completed Drivers Ed and has her learners permit. (Deep breaths…Deep breaths) I still remember the feel of her in my arms for the very first time. 4. My oldest son has had a growth spurt. We can look each other in the eyes now. I remember the first time I saw those beautiful eyes. 5. My youngest son is also growing so fast we can’t keep clothes that fit. I’m no longer able to pick him up. My baby. 6. My metabolism seems to have slowed to a turtle’s pace. 7. My knees creak when I walk up the stairs. 8. I used to be warm natured, and now I am always cold. 9. My vision is terrible! 10. As I sit here, I have a hot rice sock on my neck. I reached up to brush my hair this morning and pulled a muscle in my neck. How does this happen? I was trying to brush my hair! Someone, please commiserate with me or tell me I’m youthful. This post is linked up with Oh Amanda. 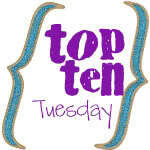 Visit her for Top Ten Tuesday. I’m not a patient person. It’s not a virtue that abounds in me, but I do try to work on it. Mostly. A couple of months ago I wanted something. I thought it was going to happen. The excitement was there, and then the nerves. I said “if it’s meant to be it will be, if not, God will close the door.” But I believed that He wasn’t going to close the door. Then He did. Closed it with a bang, and I was hurt. There were tears and questions, but I got over it and did believe again that it wasn’t supposed to happen for me. I moved on and was enjoying where I was. Last week it came back up in the forefront of my life. The opportunity is there again, but this time I was leary. There were nerves that didn’t exist before. Should I want this when I’m happy? Am I supposed to do this? I prayed about it, and enlisted prayer partners to ask Jesus to just give me an answer. A flashing neon sign if you will. After a few days of silence, I began to wonder if this was His answer. No answer means don’t go for it. Then I started thinking about free will. Is it me using free will if I went for it when I wasn’t supposed to? Because then He could just shut the door again, so it really wouldn’t be that bad. All of these thoughts were running through my head, and I started to over analyze all of them. Talking with some people that I really respect helped me sort out my feelings, so I went for it. Now I’m waiting. Not so patiently. Actually, this morning I was going to talk to someone and see if I could find anything out, but as I was thinking about it, His voice whispered in my ear to Be Still. So I listened, and I was still. So, this is me, blogging it out, as patiently as I can. I don’t want to give more information yet, but I promise I will either way when I find out. It’s a story where it makes me uncomfortable, but God might be choosing to stretch me and use me. We’ll see. I just watched something on the Doctors about the dangers of cheerleading. Let me tell you, every single time I see my baby girl thrown up into the air and rely on 3 other girls to catch her, I pray! I cringe and hold my breath until she is safely walking back. I think I must be crazy to let her do this, because any fool can tell you the dangers of it. What no one talks about is the emotional dangers from cheerleading. Some of these girls are just mean. If you’ve seen the movie “Mean Girls”, with Lindsay Lohan, you’ll know what I mean. This has been an emotionally taxing year, and it’s only half over. Our neighbor publicly denounces us in the newspaper for allowing the sewers to come across our property instead of his. My response, GET OVER IT! It started about two hours ago, right as we had to go pick up Brooke from school. Snow and freezing rain! I was going through the intersection and someone, a dark haired lady in a maroon altima with license plate #575* to be exact, ran through her red light and came right at me into my lane of traffic. Did I mention the snow and freezing rain? Yeah, not a good mix. Tires screeching, me swerving into the other lane to avoid her, and only the hand of God was in between us. Then she sped off, leaving me in shock that we actually didn’t hit. Thank You Lord for saving us! Tuesday night and Wednesday morning we were pelted with freezing rain and ice, so we had hoped for a 2 hour delay in school, but no such luck. I just have a problem with scraping the ice off of my car, while little pellets of ice hit me in the head, to drive my kids to school. Apparently the school board isn’t as concerned as I am. It wasn’t better at the end of the day picking them up either because it had continued to sleet most of the day. I took a few pictures to share with you, and obviously that didn’t happen. Yesterday was Valentine’s day. I hope everyone had a great one, and felt totally loved. I fixed a great meal for everyone, and even dessert that was red to match the theme. It was the best meal I’ve made since Thanksgiving, and it was a whole lot less work. That made it even better! It was pork tenderloin and roasted veggies, angel food cake with strawberries, glaze and whipped topping. Again, I took pictures to post, and it hasn’t happened. Today Brian and Brooke are together on a ski trip (a school field trip). This was one event that I passed on to Dad to do, as I really didn’t want to be in traction for the next 6 weeks! Field trips sure have changed since I was a kid! I talked to Brian earlier and they both still had all bones intact. He was on the lift watching Brooke go down. I’m sad sitting here knowing that I’m missing such a big event with her! I took a picture this morning, and sent the camera with instructions for them to take lots, LOTS of pictures. (Do you see a theme here with pictures? I’m starting to think I should change the title of this post to something like, ” I took pictures but didn’t post them!) Well, I can just imagine her and all her friends laughing ang having a blast together. She deserves it too. I’ve been a little worried about her. She’s been complaining of a headache and stomachache a lot lately, and I’ve been trying to get out of her what’s bothering her. The typical pre-teen, she likes to keep things to herself. She told me that she’s being bullied by someone at school, someone who we’ve had problems with in the past. It hurts me to think about the pain she’s felt, and kept it to herself because she knew I would call the school to try and fix it, but then she would be a tattletale. Brian and I both talked to her, and yesterday she nicely asked the girl to stop. We’ll see what happens next. I’m praying about it. That’s about all the random thoughts I have for now. Maybe I’ll post some pictures soon…. One more example of bad perfectionism. I was asked to make 90 invitations to a Christmas open house where my daughter dances. When asked, I was buttered up with, “I looked at some stores, but thought you could do something nice and crafty.” OK, no pressure. For literally 2 days I worked on those things. It took me awhile, (techie challenged), to copy and paste the text onto a page, and figure out what size, what graphics, etc. Then I couldn’t print them out on plain paper, so I copied/scanned some Christmas paper that I had laying around. Then I needed to print those off first. I ran out of colored ink very quickly. At one point I said something like “it would have been easier to just go to my friendly UPS store and have them do this for me”, but I didn’t listen. I finally got them printed, and this was the same day as the crash, so I was stressed anyway. Once printed, I needed to EMBELLISH. Don’t you just love that word? I thought I did better this year, because I didn’t put much emphasis on every invite being different from the others. I had 5 or 6 different scanned papers, and a big Christmas tree die cut on each one. I alternated, and half of them had the tree on the front, and the other half had the tree on the inside. The ones with the trees on the inside had stickers or something on the outside. Did I say I worked on these mostly all day? Then I went to get some more printer ink, stickers, glitter glue, rubber stamps…… and came home, put the kids in bed at 9:00, and sat back down to finish. I did that at 4:46 AM. Wow, I was tired when I got up at 6:30, after hitting the snooze button 3 times! I had laid them out for the glue to dry, and decided that the ones without a tree on the front looked too plain. So 4 hours later, I had them finished again, with even more glitter glue. Why do I do this to myself? A simple project turned into a nightmare! But they were reeeaaallllyyyy CUTE! Today I felt so small and inadequate. It was the worst feeling. As Brooke, Matthew and I were leaving for church this morning, the car was slow to start. I thought at that time that I needed to get a new battery, so we wouldn’t be stranded. Helpless. And then it happened. We came out of church, and were talking to Matthew about his class, and as I turned the key we heard nothing but a click. In that instant, it is amazing how many thoughts can run through your mind. Matthew was telling me I needed to look under the hood, and Brooke was starving and concerned about getting Arby’s for lunch. Brian and Zach were gone, so I knew I couldn’t call them. Luckily, we were at church, and lots of people wanted to help. Two guys went into the church barn and looked for some jumper cables, with no success. One of them said he would run and buy some, and his wife offered that they would drive us home. I ended up callng my father in law, he came, and within minutes we were running. (Straight to the auto parts store!) I don’t ever want to be in that position ever again. Not only did I buy a new battery, but also a battery charger. I guess it’s like jumper cables but you don’t have to hook up to another battery. Self sufficient! That’s what I like. I am having one of those days. You moms know what I mean, but I will elaborate anyway in hopes that I will feel better when I get it off my chest. OK, yesterday was the first day of school. That itself has me out of sorts. My daughter started middle school, ugh, and my oldest son third grade. They are in different schools. She has to be at school at 7:30 am, and he has to be there at 8:45 am. At 12:30 I had to take my hubby to the airport, and I will pick him up again Friday night. (He is in Texas enjoying the tropical storm.) So at 1:30 pm, I had dropped 3 of my loved ones off at different locations, and explained to my 3 year old at least 30 times why daddy would not be “right back.” I was going by the middle school, which by the way, our house is a mere 3 miles from, and on the same road, but they are widening the road and it is closed right before the school, so we have to enjoy a detour four times a day. I digress…anyway, driving by and thinking it’s almost time to pick her up. Do I really want to detour to get home for 30 minutes, and detour back? We opted to sit in the parking lot and watch the newest installment of Veggietales. The chill time was needed by both of us. My daughter had a great day in middle school, and I hope she continues to enjoy it. Third grade was “good” for Zach too. It’s funny, Brooke told me every little incident about her day, and Zach says “good” and that’s all I get. I tried asking him questions, and he was a good sport for a few of them, and then he grew tired of it. We came home, and then ran Brooke to dance, ran to McD’s for the boys, home to eat, back to dance to video tape choreography, back home, back to dance to video and pick Brooke up, back home and finally to bed. We started over again this morning, but I did have a wonderful friend take Zach to school. He had hesitations at first, but he doesn’t really like change. He informed me when I picked him up that he wanted to ride with Andrew all the time. I don’t feel like super mom, and I don’t feel the love right now! That is the day I am having. I know some of you can relate, and I sypathize with you. I am feeling your pain right now. I pray for all the moms out there, Lord, I just ask that you bless us with your favor, and fill us with the Holy Spirit. Forgive our sins and help us to start clean with You every day. Our mercies are new with You every morning, and I am so thankful. You give me strength when I am weak, refresh me when I am tired. Please help me to use the opportunities that You give me, so that I grow in You, and teach those around me as well. Help me to lead my children into Your light, and train them in Your ways. Thank You for the peace given to me.